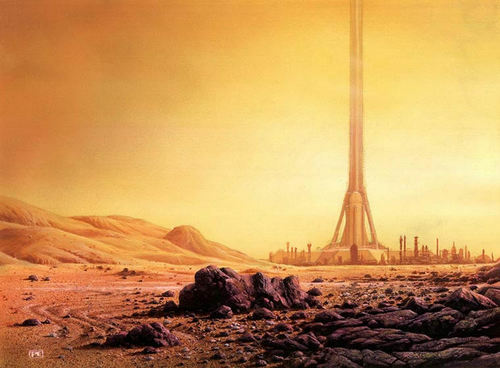 Tharsis Kahazad is a major city on Mars, Sol. Although it is a khazad, no other city on Mars can rival it for it's altitude. The city is located at the top of the Pavonis Mons, part of the enormous Tharsis Montes mountain chain and right on the equator, making it the natural location for Mars' prime space elevator. The city, named after its predominantly underground location in a massive mountain, was initially founded in 2204 to support a spaceport on Tharsis, although it wasn't until a space elevator was completed half a century later that the city became significant. Now the primary link between Mars and the rest of the solar system, Tharsis Khazad rapidly grew. The combined importance of Tharsis as a strategic target and the enormous altitude meaning the atmosphere would never be breathable caused the city to stay a Khazad even as it grew. The city stayed one of the most important transport hubs for much of the early colonisation of the planet, even though it had little industry but the support of the elevator and supporting its own needs, the sheer volume of traffic passing through saw warehouses, trading centres, and so forth open up continously. Its status as the main link to the rest of the solar system saw several branch offices and corporate headquarters established, along with embassies, foreign exchange centres, and other business centres. It only declined in importance in the late 24th century as more space elevators were constructed and the difficulty of shipping goods up the Pavonis Mons and the aging equipment began to take its toll. However, it promptly snapped back to importance during the Jovian War, when the Long Rain destroyed or damaged most of the other elevators. By luck, Tharsis had suffered only minor damage. During the later half of the war, the out of date and overstretched facilities of Tharsis played a critical role in the rebuilding of the Martian infrastructure. As other elevators were repaired and reconstructed and terraforming proceeded, the near vaccuum environment became an advantage to the storage of certain goods, and the throughflow of goods specialised. Throughout its long history, life in Tharsis Khazad has revolved around its space elevator, and the prosperity of the city as a whole was tied directly to the flow of trade. As such, much of the Khazad is dominated by trade interests and the corporations running them. Also notable is that the height of the Pavonis Mons places the city far above altitudes with breathable atmosphere, so in many ways the city is more like a trade station than a surface city in terms of daily life and facilities.